Home security safe with a €1,000 Cash rating or €10,000 valuables rating. High security electronic combination lock powered by 4 x AA batteries (not included). Back up override key in case of lock out. Black powder coat finish with carpeted floor. Access point for Laptop power cable. 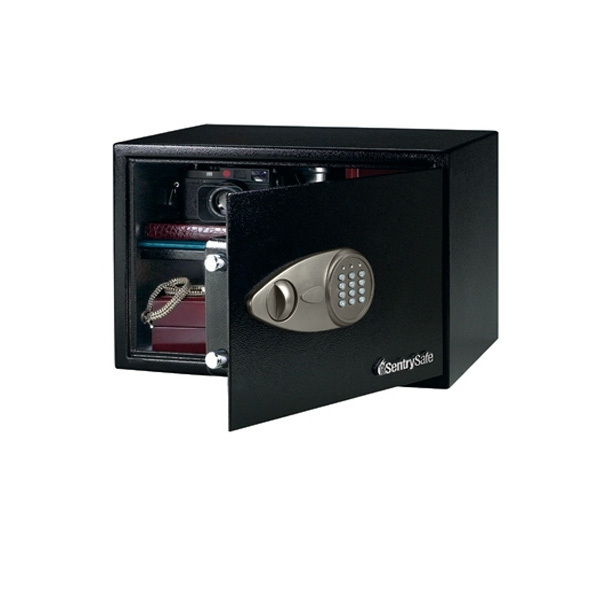 The X Safe Series by Sentry Safes is designed for home or office use and provides security protection at an affordable price. Available in a range of five convenient sizes, the smallest model, X031 is secured by a double bitted key while the four larger sizes are secured by an electronic combination lock including a back up override key.. The X Safe Series has a recommended cash rating of €1,000 or valuables rating of €10,000* and is ready prepared for floor or wall fixing (bolts supplied).